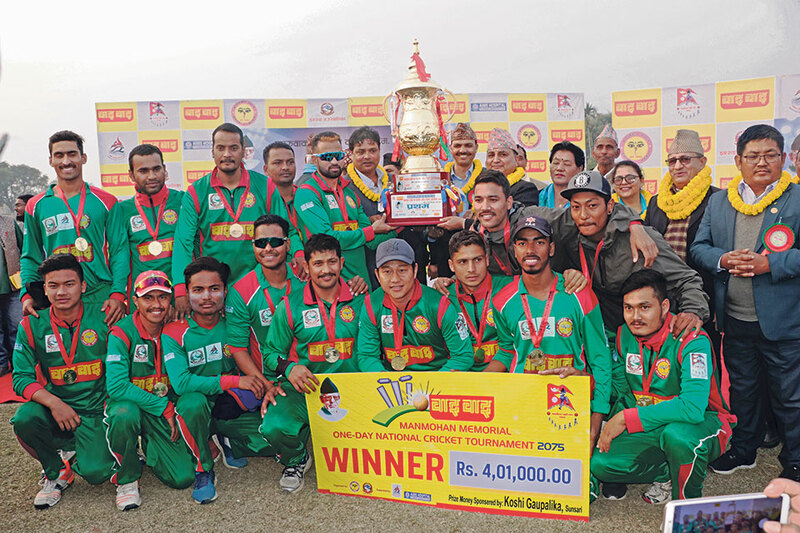 KATHMANDU, Jan 20: In the battle of the departmental teams, Tribhuvan Army Club defeated Nepal Police Club challenge by a 83-run to lift the first ever Manmohan Memorial Cup (MM Cup) trophy in the final match played at Inaruwa Cricket Ground, Sunsari, on Saturday. Nepal Police was all out for 166 runs chasing the target of 250 given by Army which won the toss and elected to bat first. Left-arm spinners Shahab Alam and Kushal Malla led the bowling attack for the winning team sharing three wickets each to bundle out Police in 42.5 overs. Yogendra Singh Karki top-scored for Police with 51 runs followed by Himanshu Dutta and Amit Shrestha’s 29 and 25 runs respectively. Similarly, Army’s Rajesh Pulami Magar stepped up in the final match scoring 61 runs supported by Kushal Malla’s 49 runs to post a total of 249 runs in the 50 overs for the loss of eight wickets. Teenager Malla was adjudged player of the match for his all-round performance in the final. Likewise, Dilip Nath of Police was adjudged player of the series whereas his teammate Sagar Dhakal and Army’s Bhim Sarki were awarded with the best bowler and best batsman of the tournament. Player of the series Nath received Rs 51,000 followed by Rs 21,000 each to best batsman and bowler. Saroj Basnet of Inaruwa was selected as emerging player of the tournament. The winner of the tournament Army bagged cash prize of Rs 401,000 whereas the runner-up Police received the cash prize of Rs 201,000. Province 7 team was awarded with the Spirit of the Cricket award for their disciplined behavior throughout the tournament. A total of 12 teams participated in the event including three departmental teams, one local team, Inaruwa, and one team from India, Supaul.